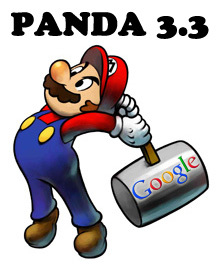 Google is currently running a Panda update, I believe it started sometime late Sunday night or early Monday morning. Seeing a huge change yesterday (Sunday 26th) - organic referrals up across the board. Almost 300% increase compared to previous Sunday. Still shooting 50% less than pre-Panda (April 2011), but I removed a lot of content so would expect it to be. Other webmasters at the forums also took notice but it seems like it is still rolling out. Google said, "a handful [of these updates] are actually rolling out today and tomorrow." This update is just a "data refresh," like the Panda 3.2 update on January 15th. A data refresh means there were no changes to the Panda algorithm, it means they only ran the algorithm again. So some sites were hit hard and some sites were freed and seeing a boost in traffic. Of course, a data refresh can be serious for sites, if they are on either side of the coin. Like our one year Panda anniversary poll said, 87% are still suffering from Panda. So I hope many of you benefited from it.